Plan events. Meet your friends. Send a Trigger to your friends or family with the help of the triggerYoo Android App. The triggerYoo Android App is available at the Android Play Store for free. The development of the iPhone triggerYoo App has finished. The iPhone triggerYoo App is now available at the App Store for free. With the iOS triggerYoo App you can Trigger yore friends or family by using the iPhone. Annoyed to plan an appointment with friends over endless SMS or WhatsApp messages? And when the appointment is then discussed with all, it gets lost in the countless messages. Why not doing it easier? Create an appointment and send it to your friends. Get accept or decline messages for the appointment through the app. Add the event automatically in your calendar to remind you. Quite simply. 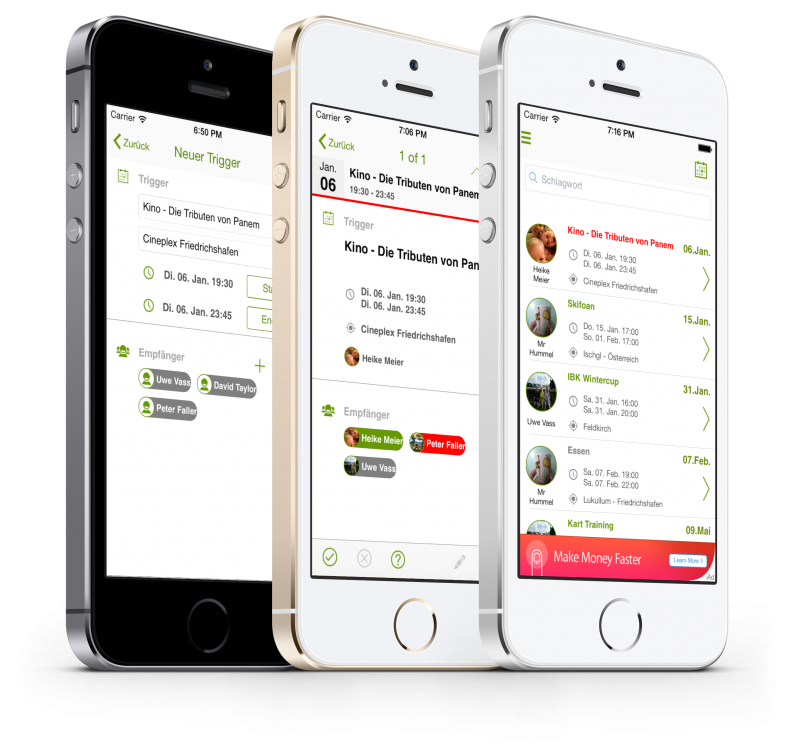 Create an appointment on the triggerYoo app and add the friends from your phonebook. Send the trigger to your friends using the app. Not each of your contacts has the triggerYoo app? No problem. Those who are not yet registered on triggerYoo gets the message via SMS at the expense of triggerYoo. With the help of the SMS, the new user gets the access to his account and she/he can respond to the trigger with the app.